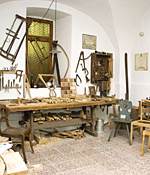 The German Chair-Making Museum in the town of Rabenau celebrates the traditional craft skills that have been practised in Germany’s oldest centre of chair-making for almost four hundred years. The variety of chairs on view and the collection of historic tools and woodworking machines are probably unrivalled anywhere in Germany. A special witness to the past is the early twentieth-century machine room once belonging to Rabenau master chair-maker Kurt Aehlig, preserved in its original form and set up in the museum’s vaulted interior. 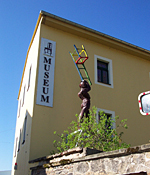 Besides the exhibition on the craft of chair-making, the museum also presents a collection relating to the locality, comprising interesting objects connected with the town’s history and the “Rabenauer Grund” nature reserve.